All Products > "04881 Revell 1/600 Klingon Battle Crusier"
The D7 battlecruiser is regarded as the most important class of Klingon ships in the 2nd half of the 23rd century and as the symbol of Klingon power. 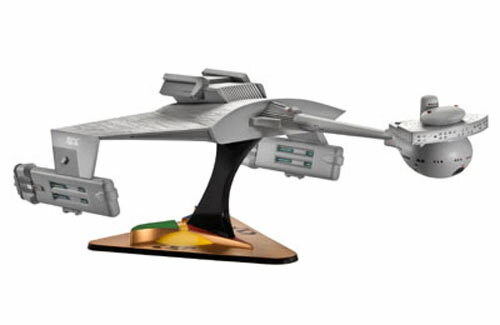 The cruiser was specially designed for long-range missions including far beyond the Klingon sphere of influence. The design relied on tried and tested concepts: a typical trapezoid front section with command pod, a long attached neck, followed by the widely flared out engine section with attached impulse drives, linked via wing-shaped elements with suspended warp drives. The heavy cruiser with its 440 man crew was designed for missions of up to two years. Development started in the mid 2230s, accelerated in 2245 by the appearance of the Constitution Class, so that the first ship went into service in 2250. The D7 was in regular production until 2269 and became the type of ship design that remained in existence the longest. The D7 was considered to be the specific opponent of the ships of the Constitution Class. The D7 was superior as regards both acceleration and manoeuvrability and also impulse and warp speeds. The over 300 examples of the 228 m long heavy battle cruiser D7 differed in some details and had different equipment. The importance of the D7 to the Klingon Empire is shown by its very long service life of 100 years.